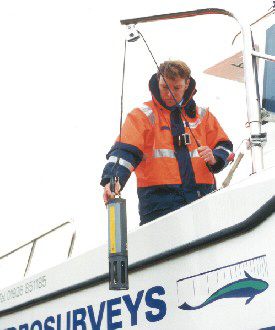 HYDROSURVEYS operate a range of instruments for flow metering, water quality testing, plume monitoring and temperature profiling. We have experience in the installation and maintenence of fixed metering devices and data-recording equipment for water quality and hydrological investigations. 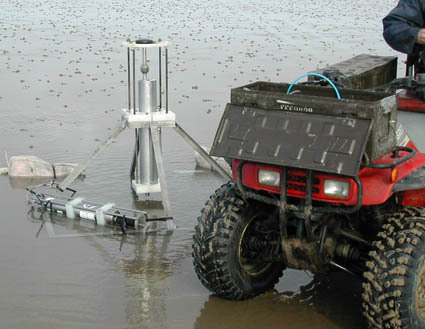 We have undertaken long term studies on the effects of suspended sediments on tidal water quality and dissolved oxygen in the River Towy in S Wales, the R Lune in Lancashire and the Yorkshire Ouse. 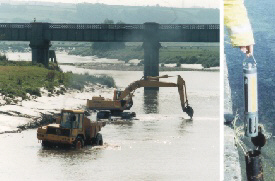 The studies have monitored the impacts of discharges, river re-alignment and engineering schemes on water quality, sediment transport and channel bathymetry. 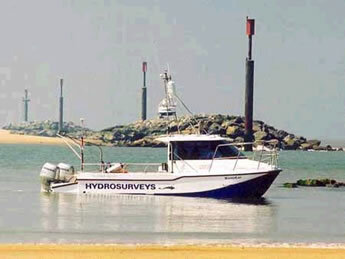 These studies have involved the maintainance of instruments in estuarine and offshore locations for numerical modelling of fluvial and coastal processes, wave and tide activity, suspended solids and current velocity. Our Services can be individually tailored for low cost 'snapshot' surveys or for fixed, long term installations to assess the extent of daily, seasonal or tidal variation. Estuarine water quality trace in late summer, showing 12hr tidal and 14 day lunar cycles.